Engobe (noun) is very much like slip. The differentiating factor is that engobes are formulated using fritted material, which reduces shrinkage. Due to this change in components, engobes are used on pottery that has already been bisqued. The use of engobes can actually be traced back to 3000 BC, where digs have uncovered colored pottery. Slips are most commonly known for being just a mix of clay and water and usually a colorant, such as an oxide or a stain. An engobe has a similar make-up to slip but is produced with less clay than a slip; the rest of the ingredients of an engobe are made up of flux or silica. Flux helps the process of making the clay liquid and also lowers the melting point of silica. Silica is a glass former; in other words, it's ‘an oxide that can readily form from the glass’ and is normally made from quartz ground up into a fine powder. The properties of an engobe sit in between a slip and a glaze, as a ceramic glaze is defined as ‘a mixture of powdered materials that often includes a pre-melted glass made into a slip and applied to a ceramic body by spraying or dipping and is capable of fusing to a glassy coating when dried and fired’. You can usually tell the difference on a finished piece, as the glaze tends to have a much glossier finish than the slip. When Should You Use Engobes in Your Work? Engobes are incredibly versatile and can be used in your work for a variety of reasons. The main reason is to give your work a depth of color and the variety that can be created with this type of glaze. Engobes and slips tend not to have as much movement on the pot when firing, so they’re the most effective way to color your pot if you are using intricate detailed designs and patterns, particularly if you’re using several different colors. 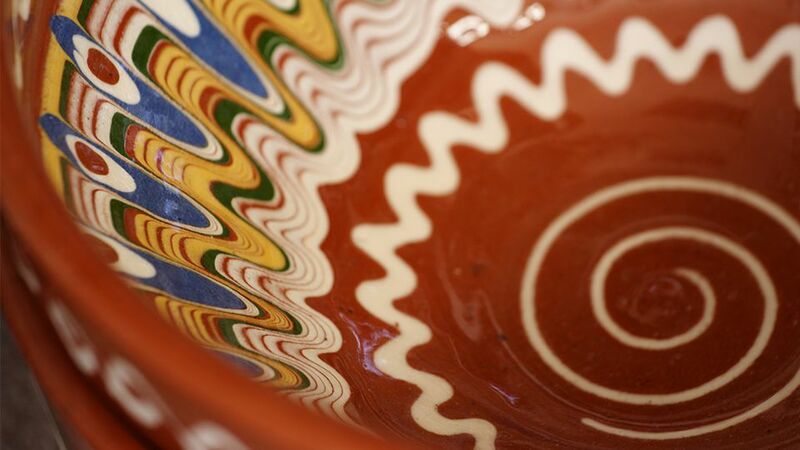 Engobes can be used to give a pot greater depth and visual range in its decorated surface. Engobes and slips stick together well because they both made up of a clay body. You should, however, still make sure your work is dried to roughly leather hard before coating it with your slip or engobe and putting it in the kiln. If you only want to do a single firing, then you must use slips or engobes, as glaze must be put onto a piece of work that has already been bisque fired. You can fire them again with a clear glaze after, which will seal in your design and give the pot a lovely glossy finish. You can be extremely creative in your pot decoration when using an engobe and use as many colors as you like. A few decorating ideas are using engobes for marbling your work. All you will need to do is cover your piece in one full color with a wide brush, making sure to pour off any excess and then run lines right down it in another color. It’s best to fill a squeeze bottle with a small nozzle for this kind of application. Then, gently swirl the two colors together in the dish. For a neater alternative to marbling, make your vertical lines in the same way and then turn the dish around. Using the tip of a paintbrush, drag the vertical lines across dish horizontally. You can paint spots and stripes and intricate designs with engobes. If you need to be precise, you can use a pencil to make the markings on your pot first. You could even make your own stencil first and lay it carefully on your work before gently brushing on your slip or engobe. Sponging on your colored engobes is another really effective way of decorating, make your sponge marks as light or dense, as you want and with as many different colors as you like. Decorating ideas with engobes and slips can be endless. What is Slip Used for in Making Pottery?